Enterprises always have various data sources, for instance, CRM system may use SQL Server, sales reports adopt Excel, ERP applies Oracle database. When it comes to actual business analysis, enterprises usually need to conduct interactive computation, including filter, group, etc among various data environments. But data Interaction between multiple data sources are not easy to realize with some traditional statistical computing tools. In order to solve such kind of problems, esProc, the desktop BI software which adapts to various data environments comes into being. Support of various data sources is an outstanding ability of esProc to solve the above mentioned problems. Data source that supported by esProc could be the database driving by JDBC. esProc, the desktop BI software is able to access such kind of databases through their JDBC interface. Besides, this desktop BI software provides a standard JDBC interface, allowing it to be called as an embedded database by outside applications like JAVA and reports. 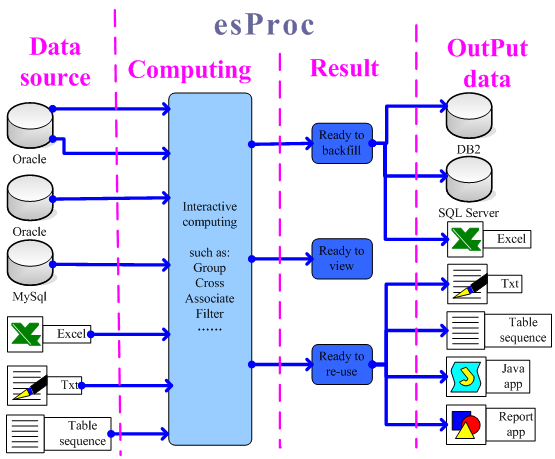 Analysts can call esProc for complex computation of mass data which is difficult to be conducted by JAVA. This adds great flexibility to analysts’ work. Sequence files that are not stored in database such as Excel and Txt are also supported by esProc. Due to the ease of use and powerful functions, Excel becomes a widely used tool by salespersons, accountants and decision makers for data computing and analytics. Built-in Excel support of esProc can read data in Excel and export data to Excel. What’s more, some scattered data including the quickly and temporarily recorded data by scientific researchers during fast experiments can be read and analyzed by esProc. Other fragmented data which is recorded in mobile phone can also be accessed by esProc. However, industries like finance, telecommunications, scientific research as well as national security defense have many old systems without common database access interface and support limited formats for data import and export. But these old systems usually support the most used Txt files, including those with extended names, such as ini, log, property and etc. esProc is capable of reading and exporting data from these old interfaces. In addition, esProc can access data in security systems which can’t be accessed directly due to outside interface lack and can only be approached through indirect interface.